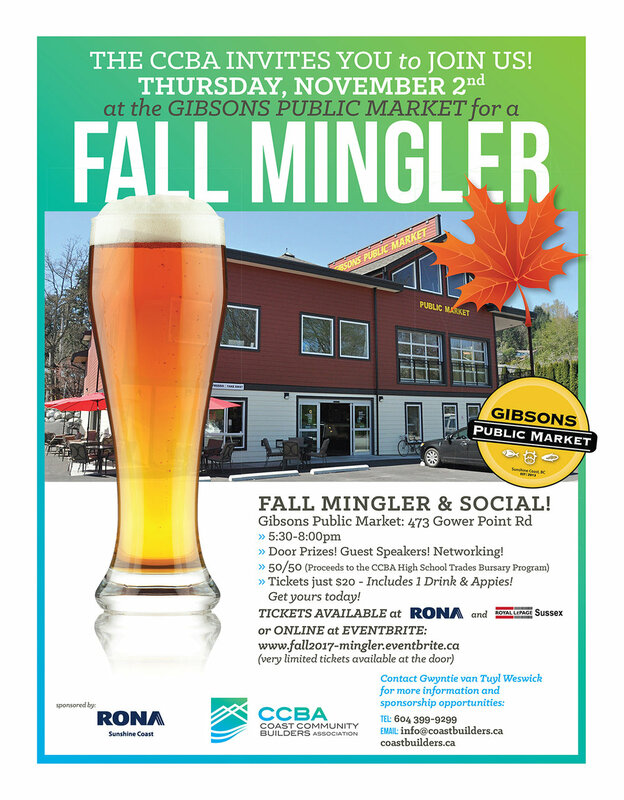 The CCBA is hosting a Fall Mingler at the Gibsons Public Market on November 2nd. Join us for a fun evening of socializing and networking. Fantastic Prizes at the 2017 Home & Garden Expo! Come visit us at the 2017 Home & Garden Expo June 10th in Gibsons at the Community Centre and enter to win one of these fantastic prizes! The goal of the Coast Community Builders Association (CCBA)is to promote sustainable growth while maintaining the Sunshine Coast lifestyle, and in doing so we need you! If your business is interested in joining the CCBA and becoming part of a unified voice that can be heard at local government please consider joining us at our AGM to learn more! THANK-YOU for another successful H&GE! The 2016 H&GE was another success for exhibitors and attendees! CCBA Summer Social a Huge Success! Our June 2nd Summer Social was a wonderful evening networking as music by Kevin Conroy’s group serenaded the group. The Buccaneer’s patio and restaurant was a perfect location, overlooking the inlet on a warm, sunny evening. A big thank-you to the Silent Auction sponsors who provided exciting prizes to be bid on. The 50/50 raffle netted $132 inaugural dividend for the CCBA’s High School Bursary Fund. Our event would not have been such a success without the generous support of John McKenzie of Royal Lepage Sussex and the graphic skills of John Ridd of Topshelf Creative. New Home & Garden Expo Ad! Last year we saw nearly 4000 attendees! This year we aim to drive an even larger audience! Sponsor logos presented in minimum 10 separate newspaper display ads. Opportunity for additional print media editorial exposure. Sponsorship announcements on social media. Enhance your corporate image and the show by engaging with local community groups to ensure they enjoy the experience and atmosphere of our show.